In play, it's a 2/2 flyer for 1BB, making it a Wind Drake in black that's slightly more color-restricted. If you haven't cast it yet, you can discard it to remove up to two cards in a graveyard from the game. I'd call it sideboard material against Reveillark or the like, but the fact that it adds to your graveyard while thinning out an opponent's could make it useful in Living End decks or other graveyard-focused combos. It's certainly not impressive as a creature, but its ability (which isn't a spell and therefore can't be countered by Rune Snag or the like) could buy it a slot in some decks, or at least some sideboards. What do Faerie Macabre and Extirpate have in common? They can both severely mess with graveyard strategies, and they're both almost unstoppable (Chalice of the Void is about your only chance against the latter; I've seen many Pithing Needles naming the former). 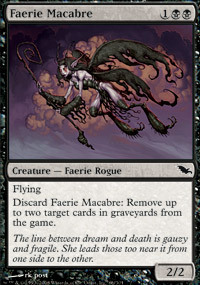 Extirpate has an advantage that it removes other copies of its target, but Faerie Macabre also has an advantage in that it is a creature and can be used as such if you don't need to remove cards from the graveyard right this second. I expect Faerie Macabre to see heavy play in every constructed format. I like this card, because it's very underrated. However, it's got a good home in constructed sideboards. It's very solid against combo decks that utilize the graveyard and against reanimation decks. The amusing thing though, is that this card doesn't do a whole lot for Faerie decks. As a creature, it's pretty basic and mediocre, but it's ability can be outstandingly useful. Its ability to remove cards in any graveyard for free in any color make this card interesting. Possible sideboard tech against Reanimator or Narcobridge. You would never actually want to cast this as a creature though. In limited, it is a quality flier. Definitely play it if it is in your colors. Constructed: Everybody beens talking about Faeries for the past few weeks. Here is one you will probably not see in any of the top decks for Standard or Block, except against Reveillark decks. But Extended this little gem might show up for anti-dredge decks. The ability to discard, just to be able to discard it on its own, to remove up to two target cards in any graveyard(s) is great. We will see if it will show up or not. Casual: Somebody will use it against their friends re-animator deck. Limited: Not that great for its ability, only card to worry about is Twilight Shepherd or Demigod of Revenge, but who will get 2 copies for their sealed deck or draft. 2/2 flyer for 3 mana is okay but it has double black in its mana cost, so it will be hard to splash. Overall it is a okay card for what it is and what it does.